UFC 236: Holloway vs. Poirier 2, is scheduled this Saturday night, April 13, 2019 at the State Farm Arena in Atlanta, Georgia. The return to Atlanta will have two interim title bouts on the line. So who is going to walk away with the belts? 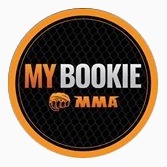 Check out MYBOOKIE’s Live Lines. 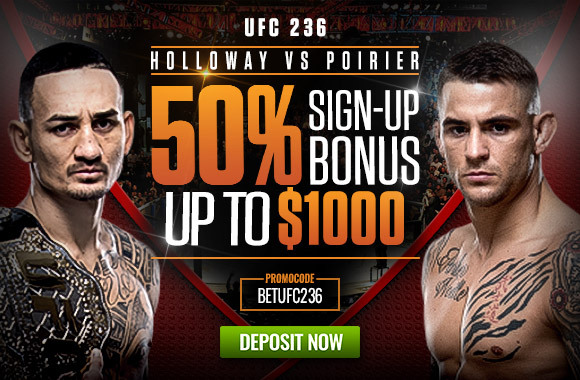 Featherweight champion Max Holloway making his move to the 155-pound weight class, where he faces top contender Dustin Poirier for the interim UFC lightweight championship. The winner of the bout is expected to be the next contender to undisputed champion Khabib Nurmagomedov’s title when he returns to the Octagon later this year. The two previously met in a featherweight bout at UFC 143 where Poirier won by submission in the first round. Holloway has gone 13-0 since losing to Poirier. Poirier has been on a recent run of 8-1-1, including three consecutive wins over Anthony Pettis, Justin Gaethje, and Eddie Alvarez to put himself in title contention. In the UFC 236 co-main event, Kelvin Gastelum finally gets his title shot, albeit not quite the way he wanted. Though he had his shot at champion Robert Whittaker derailed on the day they were supposed to have fought at UFC 234, Gastelum will now face fast-rising star Israel Adesanya for the interim middleweight championship when they meet in Atlanta. Don’t miss out on the action. Get a 50% sign-up bonus on your initial deposit deposit using promo code BETUFC236. Important notes: Minimum deposit of $100.00 or more to trigger offer. Make sure you click “Yes” under “Claim a Bonus?”, then confirm “Yes”, then click “Add a Promo Code” and enter the code into the box. Then click the green “REDEEM” button in the cashier to activate it. Offer expires on April. 30th, 2019 at 23:59 ET. If you like MMA > Join the MMAWEEKLY free MMA Pick’em Contest.